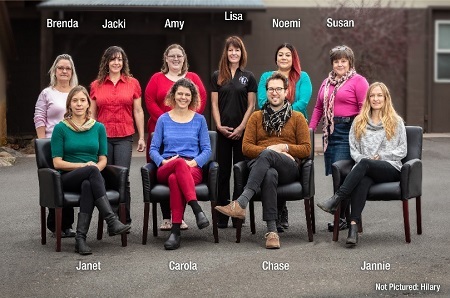 We are a team of Licensed Acupuncturists and office staff who work together to help you Get Healthier – Naturally. We have been serving the Columbia Gorge for 13 years with locations in Hood River and The Dalles, Oregon. Both clinics are wheelchair accessible and have marked customer parking. Call or email us for your FREE 15 minute consultation which includes an insurance check and a free mini trial Acupuncture treatment. Many clients choose a combination of Acupuncture and Custom Chinese Herbs, to achieve the best results. In some cases, clients may simply prefer using just one of our treatment options i.e. only Acupuncture or Chinese Herbs alone. However, all Allergy Elimination clients receive Acupuncture treatments as part of the Allergy Elimination protocol. We are happy to work with you to provide the best possible service based on your preferences and financial situation. Our focus is the treatment of pain, however we treat many different conditions. We practice a very effective style of Acupuncture and only needle below the elbows and the knees, never directly into a painful body area. We offer treatments in private rooms on massage tables or in our Big Healing Room with recliner chairs. Our Zero Gravity recliner chairs have heated Jade Crystals and offer massage as well, check out this video. We bill all health insurances with Acupuncture benefits as well as auto insurance, Worker’s Compensation claims, Veteran’s Choice and Pacific Source Community Solutions. Chinese Herbs and Allergy Elimination are not covered by insurances. We also offer a sliding fee scale, monthly payment plans and Happy Hour and Athletic Acupuncture focus treatments, which are inexpensive focus treatments for stress, to make our treatments available to as many people as possible. Still feeling hesitant? Please read our client testimonials. Bike or walk to your appointment five times and get a free Happy Hour Acupuncture or Athletic Acupuncture Focus Treatment! If you bike or walk to your Acupuncture appointments to our clinics in Hood River or The Dalles five times and log it on our Bike/Walk Punch card, we will give you one FREE Happy Hour Acupuncture or Athletic Acupuncture Focus treatment! If you don’t live in walking distance, you can park 10 or more blocks away and walk and we will “count” it! We are Blue Zones certified and invite you to take the Blue Zones Personal Pledge to live a longer, better life! You can drop it off at our clinics, we will pass it on to the Blue Zone’s Project in The Dalles, Oregon. Or you can mail it to them at BZPTD, 3591 Klindt Dr. Suite 120, The Dalles, OR 97058. Our clients tell us they hesitated for a long time before trying Acupuncture. Once they experienced the great improvements to their health, they wished they would have seen us first! Now they are sending us their friends and family, which is the greatest compliment of all. We also receive many referrals from local medical providers.